My book, "The Years of Tears and His Glory," was published in 2003 after years of "urging" and "nudgings" by the Holy Spirit. He gave me the title while I was still saying, "I can't do it. I'm not a writer. It is too painful." He encouraged me, "Just begin. I am with you." The following description is from the back cover of my book. My husband and I retired in 1990. In the year that followed we moved to Grove, Oklahoma. We were so excited. Confidently, we looked forward to the bright future that held our plans for a new way of life. Then, with no warning, on August 5, 1996, while we were sleeping, my husband went to be with Jesus. With his passing, our dreams, once filled with warmth and expectations, became transparent ashes for me. The life we had known and shared was over. In my grief and sorrow the Holy Spirit came. In the early morning hours of September 14, 1996, I awakened knowing there was a Presence within the room. I was not afraid. Although I did not hear an audible voice, He comforted me. From those moments with Him a hunger was born within my heart to know Him better. From that day forward, He became the focus of my life and an inner peace began to grow within me. I invite you to join me and follow the steps of my journey with the Holy Spirit. I believe this book will be a source of healing for those who are experiencing heartache and those who are in spiritual need. I promise you when you give your heart to Jesus, He, in return, will do a greater work in you, and you will reap the rewards of peace, joy and happiness. 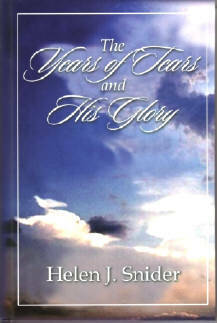 To order your copy of "The Years of Tears and His Glory," simply click the "Buy Now" button below. You'll be taken to the secure location at PayPal to finish your order and send mailing instructions to us. You might want to consider ordering an additional copy or two as gifts for friends or someone you know who is going through trouble and strife in their life. All monies received from the sale of this book will be donated to the ministries of God.